Does the United States care if Beijing ramps up its influence in Afghanistan? Probably not. One of the hallmarks of the Cold War, especially its later stages, was bitter competition between the superpowers over areas of dubious strategic significance. More than one African dictator lined his pockets with the proceeds of bribes from both the U.S. and the USSR, as each struggled for influence and markets. In places like Somalia, this competition had enduring disastrous effects on both state and society. Over the past few weeks we’ve seen several vaguely cautious articles about Chinese influence in Afghanistan. In the Cold War, the prospect of the Soviet Union gaining influence anywhere in the world would set off alarms in Washington. This makes me wonder: would anyone, anywhere in the national security bureaucracy of the United States, begrudge Beijing the opportunity to take on Afghanistan as a client state? Maintenance of a reasonably stable central state that can prevent the use of Afghan territory for terrorist attacks against the United States. Preservation of a portion of the social, political, and economic gains made by Afghanistan in the last decade. Beyond that, there’s not much. Supporting the Afghan rebels in the 1980s was a strategically viable way of threatening the soft Central Asian underbelly of the Soviet Union, as well as making Moscow pay a severe price for its aspirations to global relevance. Today, Afghanistan isn’t much use as a client state for pressuring Pakistan or Iran (perhaps the latter more than the former), and doesn’t really open a door to use influence deeper in Central Asia (getting to Afghanistan is a bigger pain than getting anywhere from Afghanistan). The point of this argument is not to suggest that “giving” Afghanistan to China is a viable option; Beijing probably doesn’t want it, and Afghanistan is not America’s to give. Rather, the question of Chinese influence in Afghanistan should serve as a reminder that a zero-sum, Cold War mindset has yet to take hold between China and the United States. 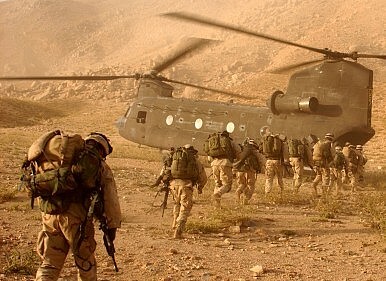 Even with respect to Russia, Afghanistan remains the great “dog that hasn’t barked.” Russia and the United States have continued to quietly cooperate on support of the Afghan government, with the United States facilitating the purchase of Russian helicopters and Russia continuing to allow the supply of U.S. operations. Indeed, the one reassuring takeaway from this thought experiment is that, apart from Pakistan, virtually no one anywhere in the region benefits from an implosion of the Afghan government, or a return of the Taliban to power. Collective action problems are real, but there’s a good chance that Afghanistan can be spared yet another round of great power competition.